April 2, 2019 Updated with confirmation from Intel of Petersen’s move. Long time Nvidia engineer, Tom Petersen, has spent his last day on Team GeForce… and is now making the short move across Santa Clara to take up a new role as Intel Fellow on the burgeoning GPU team. Petersen made the announcement he was leaving Nvidia on his Facebook page on Friday, and Intel has confirmed via Twitter that he’s joining the fold as part of its push into discrete graphics next year with the Intel Xe. 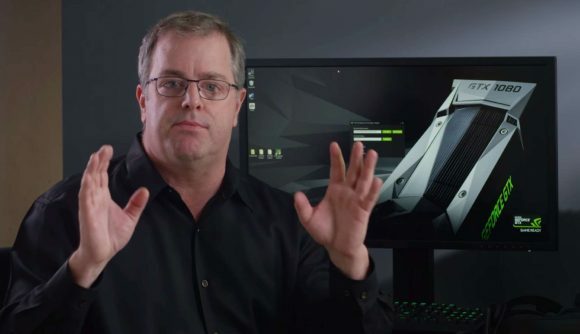 Tom Petersen has been a stalwart of Nvidia, joining the company in 2005 as Director of Technical Marketing, and is one of my favourite people in the tech industry. He’s an incredibly smart, funny, and always engaging human being, able to distill some of the most complex parts of the inner workings of a GPU down into ways that even a comparative moron like me can understand. It’s another big coup for Intel’s GPU recruitment drive, and a very trusted name in the PC hardware world. He will join up with AMD’s Chris Hook and Raja Koduri, as well as CPU heavyweight, Jim Keller, at Intel. After the initial rumours, there has now been an official announcement about Petersen joining Intel. HotHardware had word from Intel VP, Ari Rauch, that he had “successfully recruited Tom to be an Intel Fellow working with the Game Experience Team.” But today the Intel Graphics Twitter account has tweeted about Tom ‘TAP’ Petersen moving to its growing graphics team. Sure, it’s an unfortunate choice of headshot, but with Intel determined to engage more with the gaming community, having Petersen on board will mean it has one of the most popular tech proponents on board working hard to get the good word out about Intel Xe. Intel is assembling itself quite the GPU supergroup, some sort of Travelling Wilburys for PC graphics. Every other month we seem to hear of another big name in tech joining the chip giant and, in lieu of any real details about the GPU technology itself, that’s giving us a lot more faith in the company actually being able to deliver on its 2020 promises. Given that we’ve all heard Intel promising to create a discrete graphics card multiple times over the past few decades, it’s hard for the industry as a whole to trust that this time will be any different. But if Intel has managed to convince the likes of Koduri, Keller, Hook, and now Petersen, that it’s genuinely serious about GPUs this time around then we’ve got to believe that we should be taking Intel Xe seriously too.